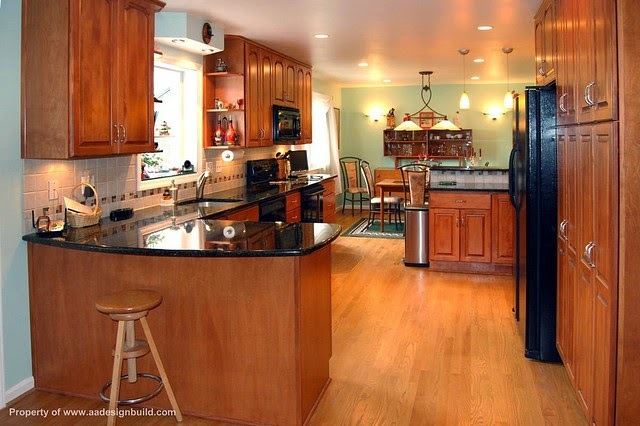 The kitchen is the hub of many homes and there is probably a constant stream of people traffic as people invariably gather around where the food and drink can be found. Sometimes the layout of a kitchen needs updating to accommodate a growing family or maybe because it is starting to look a little tired. Here is look at how you can transform your kitchen into a warm and inviting family-friendly space, where everyone will feel at home. The layout of your kitchen is important and it needs to help you to cook and socialise with ease by making the best use of the space that is available, but to get the look and feel just right you need to make sure that you choose your colour scheme with care. Yellow can give your kitchen walls an instant uplift, as it has the ability to give even the smallest space a sunnier disposition and it works well when you use the hue to paint the back walls behind shelving. Red and orange are also classic warm colours and all three of these colours certainly have the capacity to make a room feel more inviting and warmer. Red might be a bold choice for some people in the kitchen, especially when you consider that it is the colour associated with stimulating appetite, so for a country kitchen style you should probably consider a lighter shade or colour that is not quite so overwhelming. If you really want to use warm and cosy colours in your kitchen but would prefer to keep your keeping space a little more neutral, you may want to consider brown shades like chocolate chip or coffee with contrasting neutral colours like creamy white, which may be how your work top or cabinets have been finished. If you have a kitchen that is large enough to provide a dining area within the kitchen then this is very often the modern solution for many households who have moved away from using a separate dining room to eat on a daily basis. Plenty of seating is always going to a good idea especially if you have a family that is prone to large gatherings and enjoying mealtimes as a great way of catching up on the day’s events. You find some great seating options at a site like Swivel UK, where you can draw some inspiration and decide which particular style or finish would work well in your kitchen space and colour scheme. An open-plan area with plenty of seating choices will encourage everyone to hang around after dinner is over and not only does it provide a great family-friendly solution, but the added bonus is that this type of kitchen setup is always very attractive to house buyers. This means that you are potentially adding value to your home with an attractive open-plan kitchen and with a warm and cosy colour scheme to draw everyone in, no one will be too keen to stray away from the hub of the house. Josh Burke is passionate about functional and beautiful home spaces. When not working with clients revitalizing kitchens, basements, and bedrooms, he loves blogging about his inspirations and tips he's learned over the years.